Carolus in full bloom at dawn August 8, 2017. Summer breezes wafting through Cornell’s Minns Garden carried the aromas of fresh grass, notes of floral and, for a few days in August, something akin to rotting meat. Yet the chance to experience that repugnant odor drew thousands of visitors to the garden near the Plant Science Building. The reason: Carolus, one of the College of Agriculture and Life Sciences’ Titan arums (Amorphophallus titanum), as the giant, smelly tropical plant also known as a corpse flower bloomed outdoors for the first time ever in a region outside of the tropics. Carolus started its dramatic show Aug. 7, unleashing its mighty rotten-meat stench that, in the sweltering forests of Sumatra, Indonesia, attracts flies, carrion beetles and other pollinators looking for a snack and a place to lay eggs. 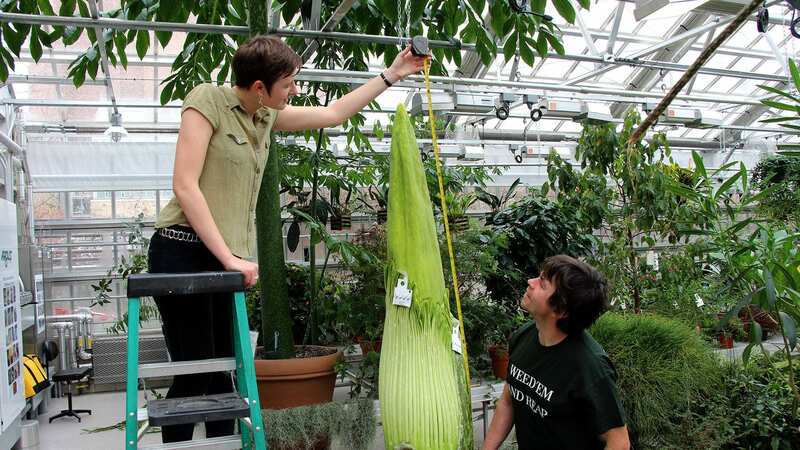 Coaxing the plant to bloom outside in the cool of an Ithaca summer takes a lot of nerve and a little luck, said Paul Cooper, the greenhouse grower for the Cornell University Agricultural Experiment Station (CUAES), who cares for Cornell’s two flowering-sized Titan arums. Filed Under: Featured plants, In the news, What's happening? 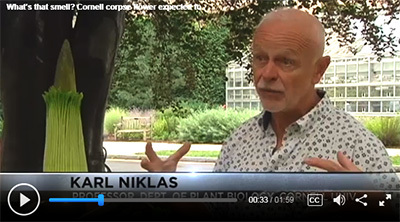 Karl Niklas, the Liberty Hyde Bailey professor in the Plant Biology Section of the School of Integrative Plant Science, explained what make Titan arums stink in a segment of WBNG News yesterday. Watch. 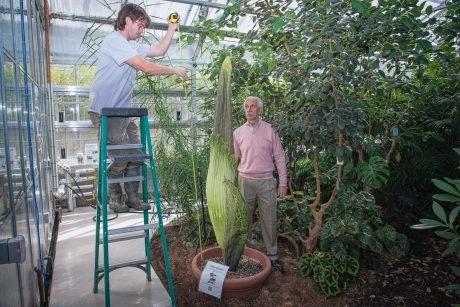 Paul Cooper, head grower for the Cornell University Agricultural Experiment Station, measures Wee Stinky with the help of Bill Crepet, professor and chair in the Plant Biology Section of the School of Integrative Plant Science. The Titan arum is one of hundreds of plants in the Liberty Hyde Bailey Hortorium managed by the Plant Biology Section. 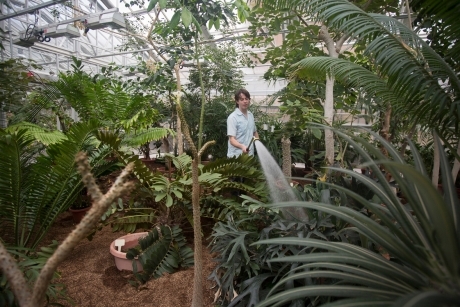 One of Cornell’s famous corpse flowers is getting ready once again to unfurl its fetid bloom. 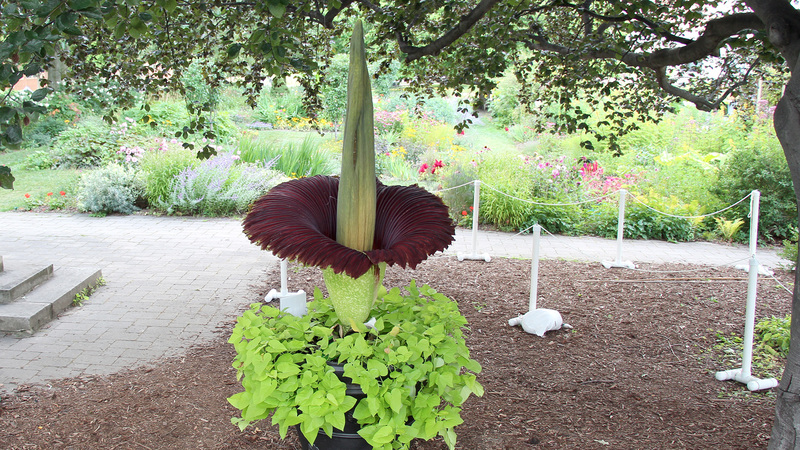 The plant nicknamed Wee Stinky, one of two flowering-sized titan arums in the living collection of the Liberty Hyde Bailey Conservatory, is prepping for a dazzling reproductive effort to make itself big, hot and smelly. Called a corpse flower for the putrid aroma unleashed when it flowers, the titan arum has evolved a reproductive strategy to lure pollinators with pungent signals akin to rotting flesh. Dark purple coloring, a sickly scent, blasts of heat and plumes of carbon dioxide are all deployed to resemble carrion favored by certain pollinator insects. It takes years for the plant to build up the necessary energy to put on such a macabre display, only to burn it all off in a few days before wilting back to a vegetative state. Ithaca College TV News Watch reporter Breana Cacciotti visits the newly re-opened Liberty Hyde Bailey Conservatory. 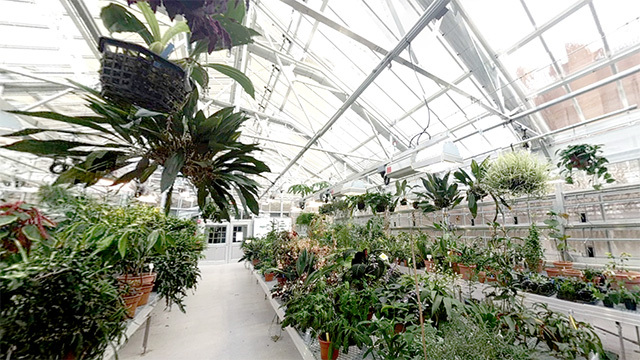 The Liberty Hyde Bailey Conservatory was featured recently on the regional travel website, Cornell’s Conservatory Greenhouse reopens after six-year hiatus. In addition to a great photo gallery, the site also features this 360-degree view of the Student Room. Step into the Palm House in the rebuilt Liberty Hyde Bailey Conservatory, and you might imagine you’ve walked into a dense tropical forest. The Palm House section fronting Tower Road features a single, large bed bounded by a walkway. The meandering path surrounding the central bed planted with trees, ferns, legumes, flowering bromeliads and other plants is meant to simulate a tropical forest trail. 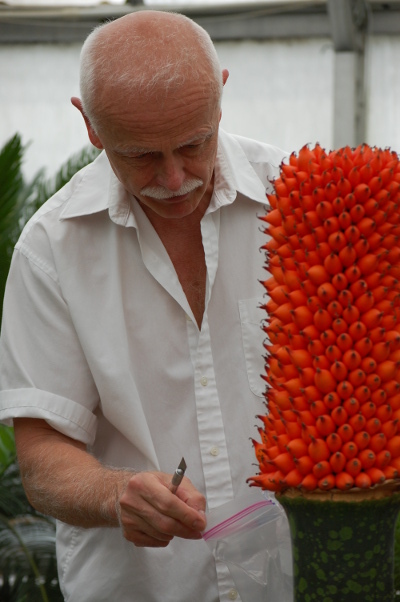 Named in honor of Liberty Hyde Bailey’s specialty, the Palm House holds bird-of-paradise, a titan arum, a number of cycads and species of ethnobotanical interest like cocoa and coffee plants in a bed filled with a growing medium made of a custom mix of coconut coir, biochar and clay-based products. The other section, known as the Student House and located closest to the Plant Science Building, features potted plants arranged on benches. Plants in this section – orchids, cacti, euphorbs, grasses and an array of primitive and unusual plants – are used mainly for teaching and some research. 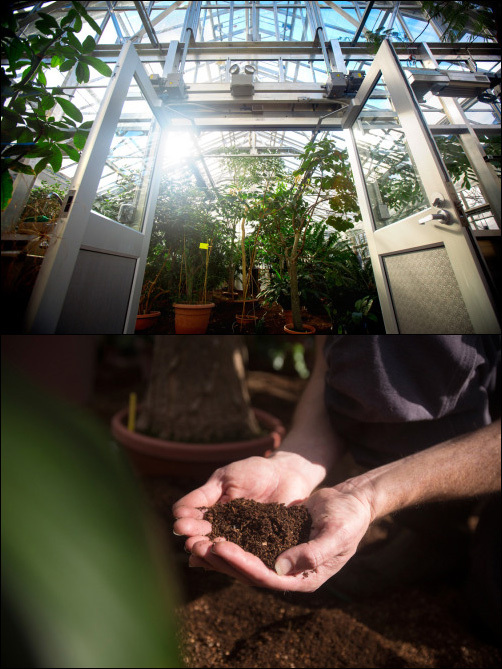 Learn more about the Liberty Hyde Bailey Conservatory Greenhouse at the Cornell Chronicle.